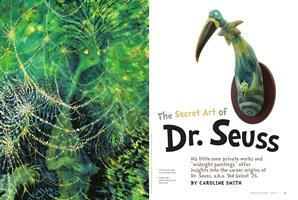 His little-seen private works and “midnight paintings” offer insights into the career origins of Dr. Seuss, a.k.a. Ted Geisel ’25. A star quits the Dartmouth baseball team for reasons he doesn’t understand. 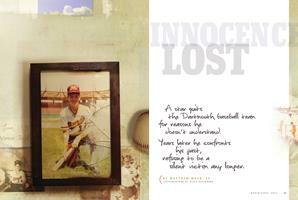 Years later he confronts his past, refusing to be a silent victim any longer. 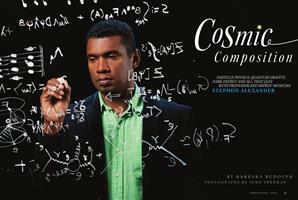 Particle physics, quantum gravity, dark energy and all that jazz with professor and improv musician Stephon Alexander. A foreign study program in Scotland offers students the chance to immerse themselves in the ideas of two giant thinkers of the Enlightenment. Part politician, part executive, A.Robert Hirschfeld ’83 rises to a prominent post in the Episcopal Church. Biochemistry professor Bernard Trumpower makes art out of science. A broken-hearted mess finds solace and support from a most unusual campus cupid. A trip into the wild brings forth fiddleheads, burdock and ginger—and the expertise of naturalist Mark Kutolowski ’99.